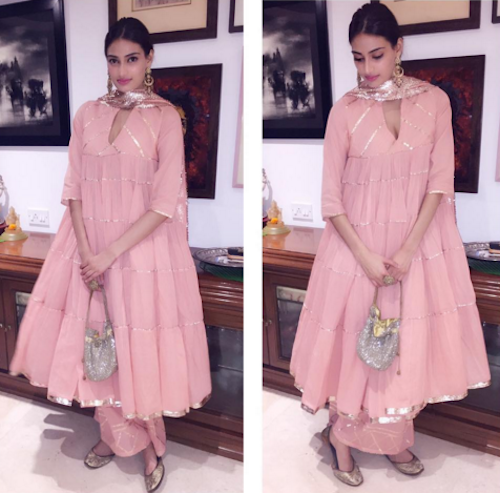 7 Simple Ways To Make Your Old Anarkali Look Fab And Different! With all the festivities going around, we know you’re having to juggle between finding Indian outfits to wear for the number of different functions that are being held. And yes, we know it’s overwhelming and boring to wear the same outfits again and again. So here we’ve put together some awesome styling tricks that will make your old anarkali as good as a new one! 1. Add a border and make it a floor length gown! This is the pretty much the easiest option you have! Your tailor will be delighted to make this slight change for you at minimal cost! You can use a combination of fabrics, materials or ready made borders. Just add this length to your anarkali and twirl around in your newly made flowy anarkali gown! It sure looks gorgeous and gives you some space to be creative too! 3. Forget the dupatta, get your jewellery box out! Yes, instead of wearing that dupatta, borrow some pretty necklaces from your mother (in all lengths) and pick some from your own collection. Now layer your necklace and add some other details like a maang tika or some kadas/ bangles and walk out in style like a regal princess. Sounds OTT, but with right combination and that gorgeous anarkali you will definitely look striking! Since all designers are making this very popular, nothing has to be in complete harmony when it comes to Indian wear. Wear a neon green colour anarkali with pink dupatta and blue churidaar, you will still look ravishing! So, go and explore the different combinations you can put together from inside your wardrobe. 6. Wear it with a jacket! 7. Convert it into a lehenga! Tried and tested: get your tailor to convert this into a skirt or lehenga and get a cute choli made with it - you can use the same old dupatta. Not much of an investment, but you still have a beautiful new outfit ready! The bonus: no one will ever remember that this was an anarkali earlier! Isn’t that cool? HAVE A STORY IDEA FOR POPxo? If you want to hear about it, we can write about it! Just tell us your idea here! 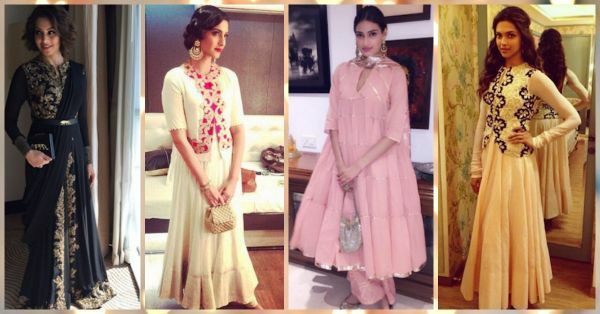 MUST-READ: 6 Fab Ways To Style Your Indian Clothes In Winter! MUST-READ: 10 Things You Should ONLY Trust Your Tailor With & Why!